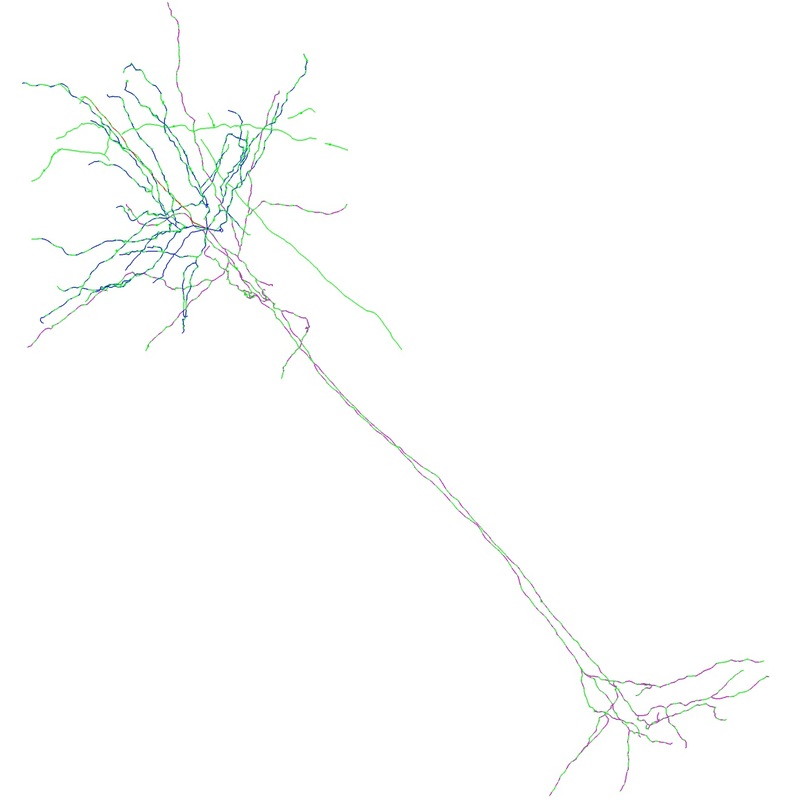 The players traced the neuron relatively well but could have extended multiple dendrite tips further. There were also some tracing errors at cross points of two branches and in areas where the dendrites were particularly curvy. The lack of detail in the curvy sections was a recurring issue. The green portions are the player created traces. The other colors were from the final trace determined by the scientists. Red is axon, blue and purple are basal and apical dendrites. Any long, continuous paths of non-green generally indicate that players missed tracing those paths. The citizen consensus captured a substantial portion of the final reconstruction. Nearly all of the citizen’s tracings were usable for the final product. The areas that were generally not captured in the consensus were areas where the neurite was coiled and windy (due to tissue drying during processing). It is possible that these areas were more difficult to agree on trajectory and so did not make it into the citizen consensus. In some cases, neurites were also not followed to completion. The green portions are the player created traces. The other colors were from the final trace determined by the scientists. Red is axon, blue and purple are basal and apical dendrites. Any long, continuous paths of non-green generally indicate that players missed tracing those paths. In general, players did a great job. Very little was changed! The biggest edits made were to extend the tips of branches, especially where the signal faded out in deeper tissue. In the future, take reconstructions farther even when the branch starts to fade. Similarly, make sure to include the ends of branches that taper and become stringy at the tip. 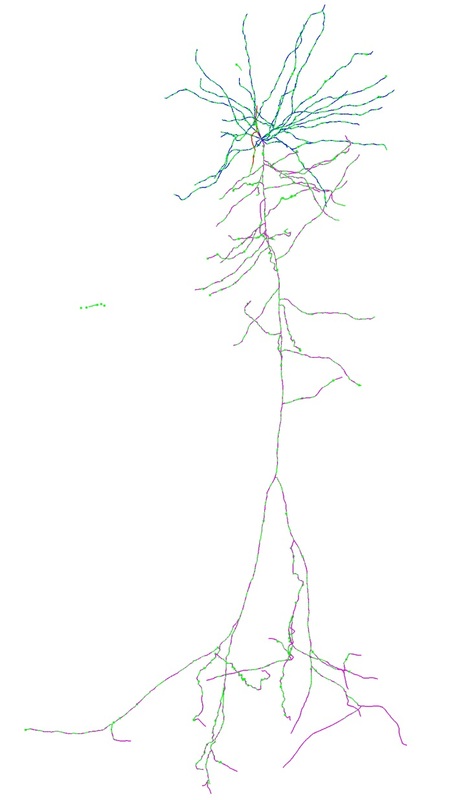 Finally, make sure to look at reconstructions from the side to see if the branches are connected accurately. Sometimes branches will emerge from the underside of another branch, and it can be hard to see without looking at the tissue from multiple angles. The green portions are the player created traces. The other colors were from the final trace determined by the scientists. Red is axon, blue and purple are basal and apical dendrites. Any long, continuous paths of non-green generally indicate that players missed tracing those paths. The players did well! 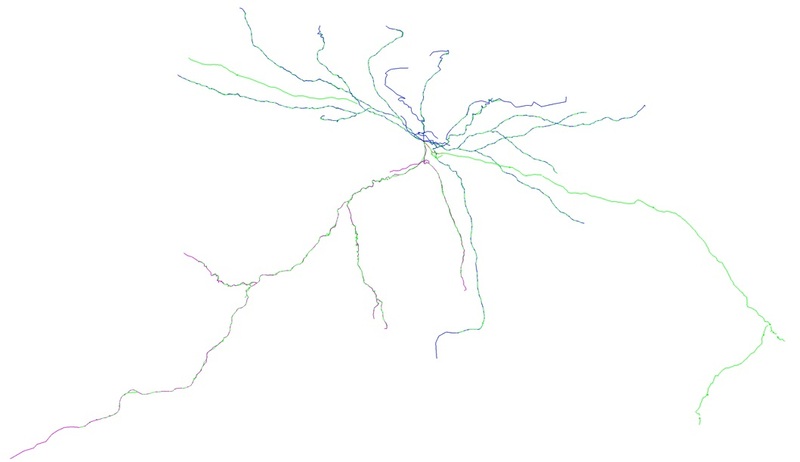 The consensus reconstruction was overall an almost complete representation of the neuron. The main issues were with capturing dendrite tips in their entirety, particularly when the signal became faint, and with following the signal accurately when there was corkscrewing or crossing over of branches. The green portions are the player created traces. The other colors were from the final trace determined by the scientists. 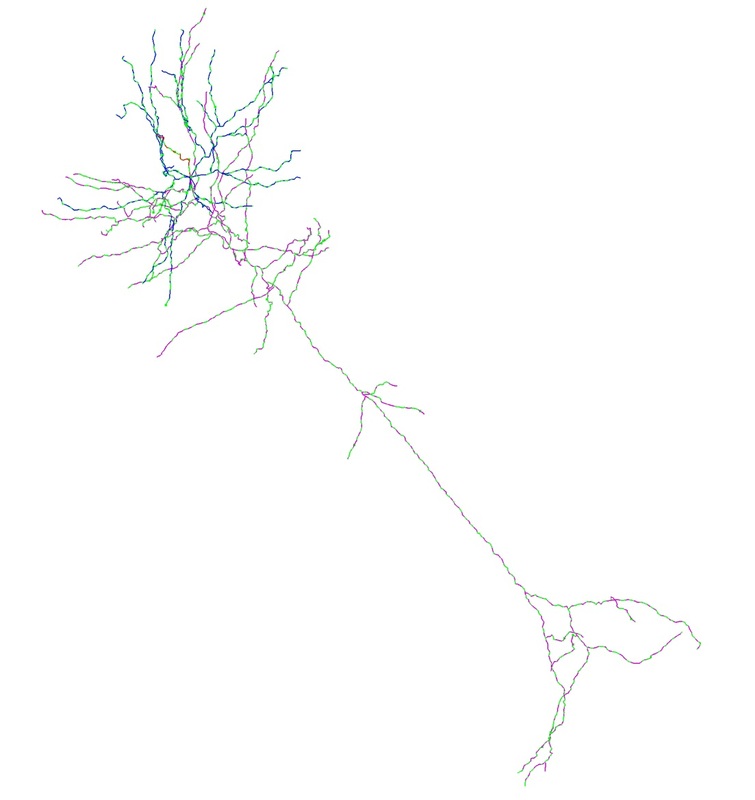 Red is axon, blue and purple are basal and apical dendrites. Any long, continuous paths of non-green generally indicate that players missed tracing those paths.